HandKrafted by Stephanie: A JustRite TSC Wednesday! 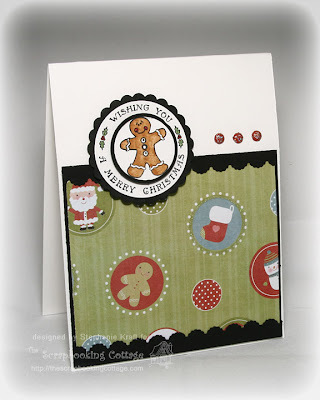 I decided to add a couple of simple cards to my Christmas stash, so I used the gingerbread man center and the border sentiment, "Wishing You a Merry Christmas". The starting point for my card was the sketch, Fall to Layout #55, but I veered off a bit from it by the time I finished. Accessories: Circle Punches (EK Success, Marvy); Scalloped Scallop Border Punch (EK Success), Markers (Copic), Glitter Brads (Imaginisce), Dimensional Dot Boosters and Sticky Dots (confessionsofaribbonaddict.blogspot.com). These are just darling! I love that snowflake paper.